As the wavelengths of light decrease, they increase in energy. X-rays have smaller wavelengths and therefore higher energy than ultraviolet waves. We usually talk about X-rays in terms of their energy rather than wavelength. This is partially because X-rays have very small wavelengths. It is also because X-ray light tends to act more like a particle than a wave. X-ray detectors collect actual photons of X-ray light - which is very different from the radio telescopes that have large dishes designed to focus radio waves! X-rays were first observed and documented in 1895 by Wilhelm Conrad Roentgen, a German scientist who found them quite by accident when experimenting with vacuum tubes. A week later, he took an X-ray photograph of his wife's hand which clearly revealed her wedding ring and her bones. The photograph electrified the general public and aroused great scientific interest in the new form of radiation. Roentgen called it "X" to indicate it was an unknown type of radiation. The name stuck, although (over Roentgen's objections), many of his colleagues suggested calling them Roentgen rays. They are still occasionally referred to as Roentgen rays in German-speaking countries. The Earth's atmosphere is thick enough that virtually no X-rays are able to penetrate from outer space all the way to the Earth's surface. This is good for us but also bad for astronomy - we have to put X-ray telescopes and detectors on satellites! We cannot do X-ray astronomy from the ground. How do we "see" using X-ray light? What would it be like to see X-rays? Well, we wouldn't be able to see through people's clothes, no matter what the ads for X-ray glasses tell us! If we could see X-rays, we could see things that either emit X-rays or halt their transmission. Our eyes would be like the X-ray film used in hospitals or dentist's offices. X-ray film "sees" X-rays, like the ones that travel through your skin. It also sees shadows left by things that the X-rays can't travel through (like bones or metal). When you get an X-ray taken at a hospital, X-ray sensitive film is put on one side of your body, and X-rays are shot through you. 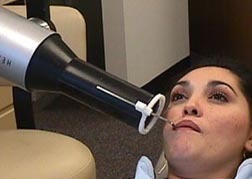 At a dentist, the film is put inside your mouth, on one side of your teeth, and X-rays are shot through your jaw, just like in this picture. It doesn't hurt at all - you can't feel X-rays. Because your bones and teeth are dense and absorb more X-rays then your skin does, silhouettes of your bones or teeth are left on the X-ray film while your skin appears transparent. 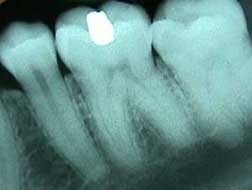 Metal absorbs even more X-rays - can you see the filling in the image of the tooth? When the Sun shines on us at a certain angle, our shadow is projected onto the ground. Similarly, when X-ray light shines on us, it goes through our skin, but allows shadows of our bones to be projected onto and captured by film. 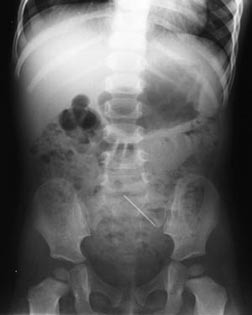 This is an X-ray photo of a one year old girl. Can you see the shadow of what she swallowed? We use satellites with X-ray detectors on them to do X-ray astronomy. In astronomy, things that emit X-rays (for example, black holes) are like the dentist's X-ray machine, and the detector on the satellite is like the X-ray film. X-ray detectors collect individual X-rays (photons of X-ray light) and things like the number of photons collected, the energy of the photons collected, or how fast the photons are detected, can tell us things about the object that is emitting them. To the right is an image of a real X-ray detector. 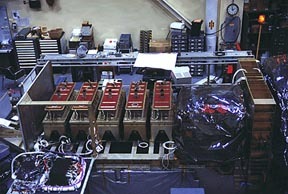 This instrument is called the Proportional Counter Array and it is on the Rossi X-ray Timing Explorer (RXTE) satellite. It looks very different from anything you might see at a dentist's office! What does X-ray light show us? Many things in space emit X-rays, among them are black holes, neutron stars, binary star systems, supernova remnants, stars, the Sun, and even some comets! 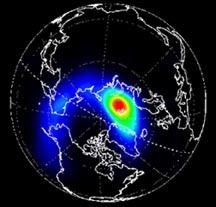 The Earth glows in many kinds of light, including the energetic X-ray band. Actually, the Earth itself does not glow - only aurora produced high in the Earth's atmosphere. These aurora are caused by charged particles from the Sun. 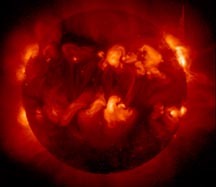 The Sun also emits X-rays - here is what the Sun looked like in X-rays on April 27th, 2000. 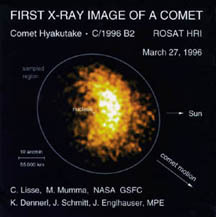 This image was taken by the Yokoh satellite. Many things in deep space give off X-rays. Many stars are in binary star systems - which means that two stars orbit each other. When one of these stars is a black hole or a neutron star, material is pulled off the normal star. This materials spirals into the black hole or neutron star and heats up to very high temperatures. When something is heated to over a million degrees, it will give off X-rays! 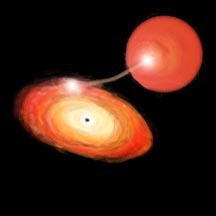 The above image is an artist's conception of a binary star system - it shows the material being pulled off the red star by its invisible black hole companion and into an orbiting disk. 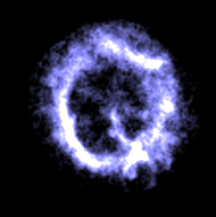 Radio: (CSIRO/ATNF/ATCA) This image is special - it shows a supernova remnant - the remnant of a star that exploded in a nearby galaxy known as the Small Magellanic Cloud. 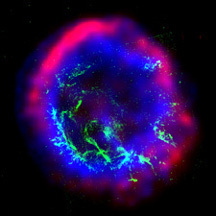 The false-colors show what this supernova remnant looks like in X-rays (in blue), visible light (green) and radio (red).